ANN ARBOR — Michigan desperately needs a confidence-boosting victory. 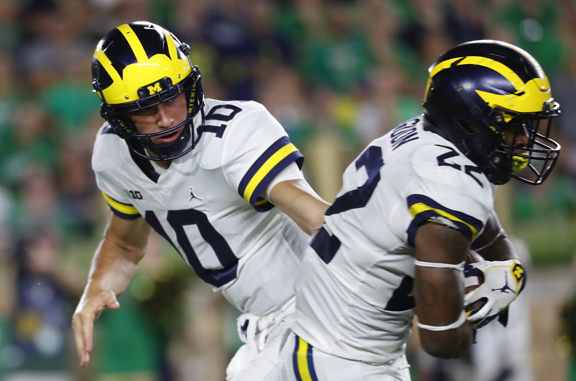 The 21st-ranked Wolverines hope to get that in their home opener Saturday against Western Michigan in a matchup of teams coming off season-opening losses. Michigan’s highly touted defense began the year by giving up two touchdowns early in the game at No. 12 Notre Dame, and the Shea Patterson-led offense didn’t live up to expectations in a 24-17 loss. Jim Harbaugh, in his fourth season as coach, could’ve used a victory to quiet critics. Since starting last year 4-0, Michigan is 4-6 and has lost four straight for the first time since Rich Rodriguez lost the last five games of the 2009 season. Since starting the 2015 season 9-0, Harbaugh is 9-9, and former players such as Braylon Edwards have joined the chorus of people no longer singing the school’s praises. Days after the latest defeat, University of Michigan President Mark Schlissel said Harbaugh was not on the hot seat and added he’s under contract for four more years. PUNCHER’S CHANCE: Western’s best hope to pull off the upset is probably to get the game to a shootout. The Broncos scored 28 points in the third quarter against Syracuse, rallying to pull within a TD after trailing 34-7 at halftime before closing with a 55-42 loss. Jon Wassink threw for 379 yards and three touchdowns and ran for a score against Syracuse.